We design websites that suit your need. Web design on the basic definition and what comes to mind when you hear it, is how artistic, beautiful colours and the animation that greet you when you open a webpage. What we offer is to create you a website that works for what you want to achieve. Web design for us is designing a website for it's purpose and targeted visitors. Websites. We all use them, but not a lot of us actually know what they are or what they do on a very basic level. The thing is, our world functions on technology and online presence now, meaning that we have to be able to understand how it works at its smallest levels so that we can build it into a recipe for success on the other side. The trick is, first, to make it all come together by tearing it apart and rebuilding. So, it's best to start at the beginning. A website is a series of pages that are all connected together with a common thread that makes up the website. This is normally a brand name or a product, or a person if it is a private website. These series of webpages all have distinct topics and sections to them that make them into strong pages that stand distinct from each other, yet are still connected by that common theme, whatever it may be. This all started due to the start of the internet in the 1990s. As it developed and changed, our world changed alongside with it so that meant that there had to be someone to put it on the internet in its early days. Websites, as primitive as they were, were designed to show information and alert people on businesses and companies when they were browsing through the internet. Originally constructed as files that you would download to your computer to read, a viewer was able to see the webpage as developed by the word processor that they chose, often causing all kinds of formatting problems. This meant that webpage soon came to the point where they could be read online to make sure that the hard work put into creating them was seen. From the opinion and eye of a webmaster. A person who takes care of a website is called webmaster. There are websites that you update regularly and left alone for a long time. Left alone websites are ones that stay the same almost forever, normally as a well planned and organised business website that offers services. An example of this is a sole trader piano teacher. The whole website is essentially good enough for a while until the owner decides to offer new services. This isn't necessarily a bad thing, it's just that it stays the same as when you initially uploaded it. This of course depends on what type of website you are taking care of. An example of a frequently updated website is a blog. New content are published every week or everyday and visitors comments on them frequently. Today's age sees websites as generally required for most major businesses. It's come a long way from when it started out in the 1990s, but the general purpose is the same, to provide information. There seems to be a fight between plain HTML and CMS operated websites when it comes to determining which is better. HTML websites are very basic, and normaly have static webpages. They are coded in HTML which translates to a series of text and images to the public's eye. They will be very difficult to manage if you don't know HTML. But if you even do, people finds then not practical, because it takes more time in terms of maintaining and updating their websites. HTML websites that you see around don't seem to change much due to the difficulty in coding them properly. CMS (content management system) websites are powerful and can create dynamic pages easily. They are user friendly from the start and will create a great page of content that you can change and tweak any way that you want. They look the same to you as they would to anyone else who is going to be looking at them, and can be changed regularly. It makes it a great way to really work with beginners in terms of designing a website. Wordpress websites are some of the best examples of CMS created pages that you'll find, as their templates are great and many are free and you can access all of the main details that you need in a way that is going to give you the results that you're looking for. This kind of webpage creation system tends to be the best for businesses who want to make the most out of what they can do and offer. Personal website: These are blogs or other personal pages that allow a person to show and broadcast their personal thoughts with the world to whoever wants to read them. A lot of website allow people to post on their thoughts, too. 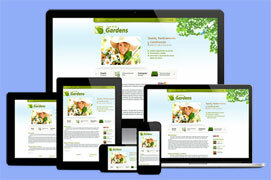 Commercial websites: These allow for the user to get their brand and their business out there for the world to see. They post all kinds of information on their websites about their products and brands, but it's based on the idea that it's all about business. To get traffic to your business or company websites, it needs an SEO Campaign done on it. Forums: These are online communities with all kinds of themes and they allow for users to communicate with each other and talk about all sorts of things online that are hard to find in other spots. It's about building connections and creating a world. Catalogues: Used for business purposes, there are some websites used entirely for showing off catalogues or brochures of a company and its products or services. These are more of a combination idea in commercial websites and are popular now with the rise of e-reading and other hyperlink options out there that exist. You have to admit that the world has changed since the creation and usage of the website, and it has opened a whole new world to look in on. Now the key is just making use of all that we are learning so that we can put together the right kind of world that works online and offline.